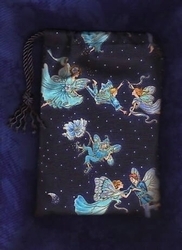 Fairies fly among flowers, gathering plants and musing on a claret colored background. 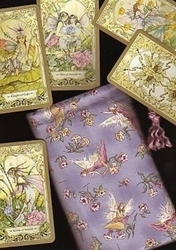 These fairies live among the flowers and berries of the hedge or a wild garden � poppies, spindle berries, rose hips, mulberries, wallflower, nightshade and black bryony berries. 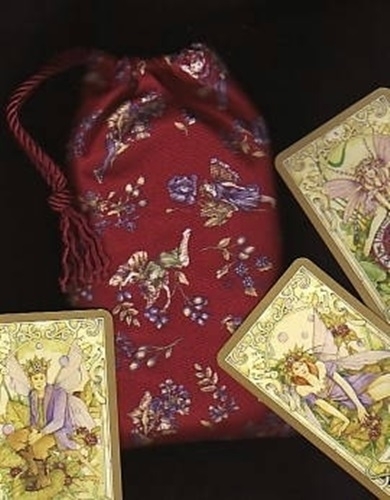 The variety of flora intermingled with fairies makes this the perfect bag for plant or fairy themed tarot deck. 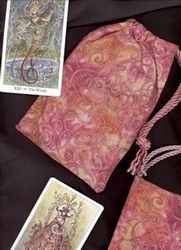 The Herbal Tarot, The Power of Flowers, and the Flower Speaks decks are all coordinate well with this bag. 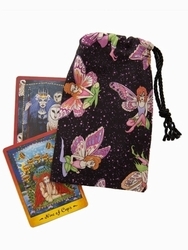 It's also well paired with fairy decks, like the one shown in the product picture, the Mystic Faerie Tarot.